Recently transplanted from Atlanta, FSC calls their style “direct address technique,” I call it using an operatic style to communicate to the audience. Shakespeare’s plays have a lot of long monologues, in which characters to speak to no-one in particular, as they muse over their inner conflicts. Director Doug Graham, a highly creative certifiable genius, directed the cast to speak these monologues to the audience, effectively engaging them. Like plays in Shakespeare’s day, which were staged with very little technical support, the actors’ ability to make the language come alive carried the show. And did it ever! Like all tragedies, Shakespeare takes a great man, who is too easily tempted by ambition, and chooses treachery, betrayal, murder and tyranny to secure his ambition. These actions unleash both external and internal forces i.e. his conscience and lack of repentance, which cause his downfall. There are great battle scenes as well as soliloquies by both MacBeth and his co-conspirator, his wife Lady MacBeth, in which they reveal their mental torment after they have committed triple murder. Using a bare set, with only a simple slightly raised platform in the center, the cast of eight played multiple roles without any confusion. Women played men, one of the witches was played by a man, and the costumer, Jessica Fern Hunt, is to be commended for creating costumes, which made all the multiple casting clear, and made quick character changes possible. In choosing somber colors: greys, browns and black, the costuming supported the ominous atmosphere of the “Scottish” play. 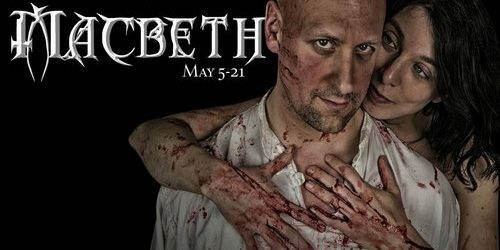 As the guilty couple, Daniel Wood as MacBeth and Jesica Avellone as Lady MacBeth were two powerful actors, whose scenes together were full passion, moral struggle and sexual politics. Both handled their monologues with intensity and nuance. MacDuff, played by Sarah Beeson, was a force to be reckoned with, although female, she was thoroughly convincing as a powerful, loyal general, who motivated by revenge, uses both force and cunning to slay the tyrant MacBeth. Seattle veteran actor David S. Klein played numerous roles including the Porter, who provides the comic relief; it was an amusing and endearing scene. Another role he played was one of the witches. With lighting, choreography and some interesting costuming the witches’ scenes were stellar. I cannot recommend this production enough; even the most committed Shakespeare haters will love this play because it is done so competently. If you love Shakespeare and are often disappointed because you can’t quite understand what the actors are saying, try this show, you will understand everything. Mondays May 8 and 15 are Industry nights.